When you walk into the lobby at Gliebers Dresses, you notice two things. It's time to remodel the lobby. The giant display featuring Glenn Glieber and Meredith Thompson accepting the award for the New England Direct Marketing Association's Cataloger of the Year in 1981. It only takes a few seconds for Executives to explain the importance of this award. Meredith Thompson (Chief Merchandising Officer): You have to understand where we came from. We were nothing. Absolutely nothing. We barely had enough money to survive. We bootstrapped the whole thing. And then sales took off back in 1980, after we expanded into Leotards, capitalizing on the whole "Physical" video by Olivia Newton John (click here). We moved into striped dress pocket dresses. We were innovating all over the place, and our customers loved it! Winning that award meant so much to us. It meant that our peers accepted us. It meant that a plucky startup can compete with L.L. Bean. When we bring a new employee in for her first week of employee orientation, I point to the display and I tell the employee "It is now time for you to use the catalog to innovate. Show us what the next wave of catalog innovation looks like." Pepper Morgan-Pressley (Chief Marketing Officer): That giant display? Geez. Somehow that was the only thing that survived the fire of 1989. Lois Gladstone (Chief Financial Officer): We spent a hundred thousand dollars last year creating keychains featuring that image. Roger alone handed out more than five hundred of them at Shoptalk. You've never seen so many keychains littering garbage cans. But Roger was happy because he found nine tweets mentioning the keychains. It really didn't matter what the sentiment of the tweets were, because Roger said bad publicity is better than no publicity at all. Heritage plays an enormous role in shaping whether a company is likely to change or not. You can tell a company they have to change. Executives can nod their heads up-and-down, knowing they have to change. But then you have the display in the lobby. The display is not changing, is it? It's a constant reminder of what the brand was, and quite honestly, it is a constant reminder of what the brand "is". You could take the display down ... burn it and put the ashes in an urn or Folgers Coffee Can. But that would rile up those who "protect the heritage" of the brand ... could you imagine how Meredith Thompson would respond? Do you think she'd ever support any initiative you have for moving the company into the future? If you want your company to change, you have to address the big display in your lobby. Every company has something they hearken back to. That "something" is what is holding the company back. These are issues we'll need to think about when we convene on April 5. Why don't you join me (click here)? P.S. : Can I show you something? I wrote this in 2011 (click here). 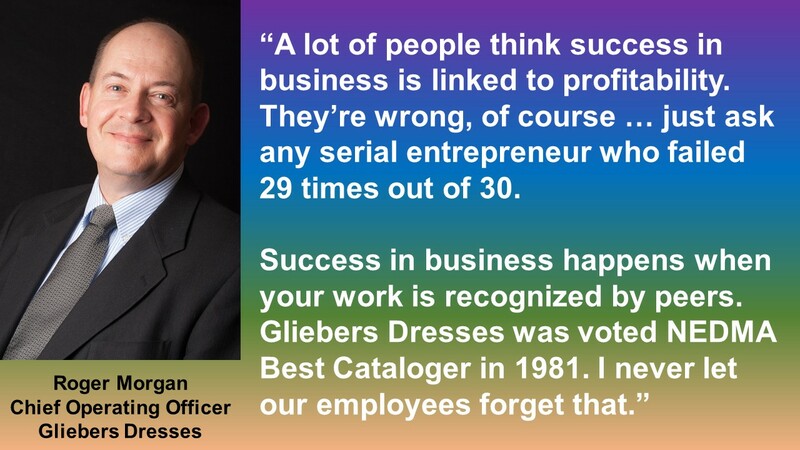 Think about this one as you think about Gliebers Dresses, ok?